Our guild is doing a quilt show this month. It’s a small venue for our guild size (we’re now at 70 members), so it was decided that hanging bunting from the rafters would be the perfect way to let everyone participate. Since I don’t know how to do anything the easy way (ha!) my flags took hours for each. One is english paper pieced, one is paper pieced, and one is foundation pieced. I got inspiration from Jinny Beyer’s book The Quilter’s Album of Patchwork Patterns. I borrowed it from the library, but I need to make it a permanent part of my quilting library. So many patterns in one place to look at and draw inspiration from. When I chose the bow tie block, I didn’t want to add an extra seam to be able to machine sew it, so english paper piecing was the obvious route. I created the paper pieces using poster paper. I have come to to love EPP. The points match up every time, and you can put together blocks that just aren’t really possible on the machine. The spider web block is a classic, but especially at this small of a scale, I wanted the seams to match up. I realized pretty quickly when putting the triangles together that in order to make that happen, I needed to remove the paper and press half the seams the opposite way. Success! They lined up beautifully. The last flag was a stretch for me. It is a wonky improv log cabin block on both sides. I am not an improv kind of girl! I like to have everything planned out. I realized two mistakes after sewing the two sides together. I had meant for the center on both sides to be near the top. And I noticed that one spot on one side that there was some seam allowance showing through. instead of trying to pull it all apart, I decided to stitch over the area to strengthen it. It ended up looking like a spider web. Something that my kids hear a lot is “Finished is better than perfect.” Sometimes I allow myself the same grace. I think that needs to be a wall hanging in our house. It was fun making these. Each on ended up being more of a super mini quilt than a simple flag, but I love the way they turned out. Come check out our show at the Edmond Arts Institute from now until October 30th. Admission is free, and the quilts are amazing! Thanks to lots of help from my very knowledgeable husband, I have a new site! It’s still under construction, but the basic functionality and look is here. Let me know what you think, if you think anything is missing, or something doesn’t look right in your browser. I’ve been trying to figure out a design for my quilt that will be in a show in Budapest. Yes, Budapest, Hungary. 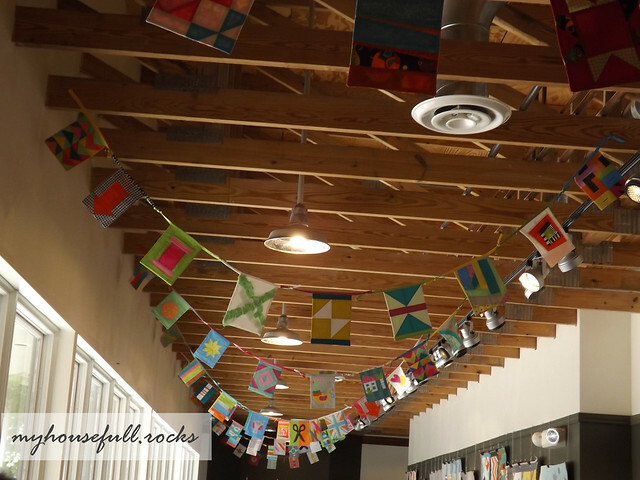 The Oklahoma City Modern Quilt Guild was invited by an art gallery that was intrigued after a conversation with one of our members. The Guild asked for commitments from members to send a modern mini quilt. I am so excited. Here are the fabrics I’ve chosen. The rosy pink was actually difficult to find. I created the color palette with paint chips – something I haven’t done before. It was fun, and I’ll be doing it again. I’m thinking of doing some randomly pieced blocks with some white sashing. I’ve been inspired by the Wonky Zoo Pens quilt. Just found out while searching for that link that the free pattern is now available. That may change my plans somewhat. I may just resize the paper pieces. 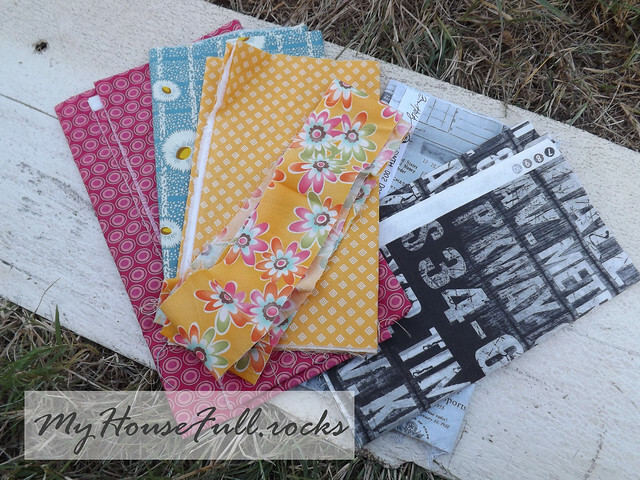 Linking with Lee at Freshly Pieced for WIP Wednesday.